THE SECOND SEASON of the US version of Celebrity Big Brother is coming soon, with the former head of communications at the White House Anthony Scaramucci among this year’s cast. Scaramucci had an infamous 10 day-stint leading President Trump’s communications team and would last longer in the Big Brother house than he did in the White House if he makes it to the latter stages of the programme. 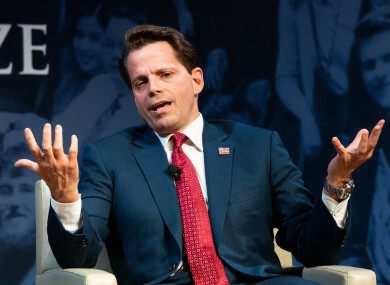 The “Mooch” has been doing the media rounds since his brief sojourn in Washington, which included charming Ray D’Arcy last year. Ryan Lochte, a 12-time Olympic swimming medalist, will also appear on the show. Although well-known for his swimming prowess, Lochte also won some unfavourable headlines during the 2016 Olympics in Rio, after falsely claiming he was robbed at gunpoint. Comedian Tom Green will also appear on the show, which will premiere on CBS on 21 January. Olympic track and bobsled athlete Lolo Jones, former WWE wrestler Natalie Eva Marie and Lindsay Lohan’s mother Dina are also on the cast. The station has confirmed that host Julie Chen Moonves will continue to host the show. Her husband, former CBS chief executive Leslie Moonves, left the network following a slew of sexual misconduct allegations last year. Email “Former Trump comms chief Anthony Scaramucci going into the Big Brother house”. Feedback on “Former Trump comms chief Anthony Scaramucci going into the Big Brother house”.